Many years ago I lived a year in Germany while studying at a university. I remember how diligent and disciplined the Germans were with recycling. They separated their glass by color, recycled their papers, and even saved, cleaned, and recycled the foil lids from their breakfast yogurt containers (the plastic containers, of course, were also recycled). Everywhere I looked I saw a conscious effort to recycle and reduce – except when it came to the automobile. With the Autobahn, there is no speed limit, and Germans seemed to feel they have a God-given right to drive as fast as they wished, the environment – which they otherwise seemed so conscious of – be damned. At that time, catalytic converters were pretty rare outside the US. I remember one high-end Mercedes-Benz (called “Daimler Benz” by the locals) that had one … but it shut itself off once you reached a particular speed in order to give you that extra boost of power (and when you most likely were spewing the most exhaust). 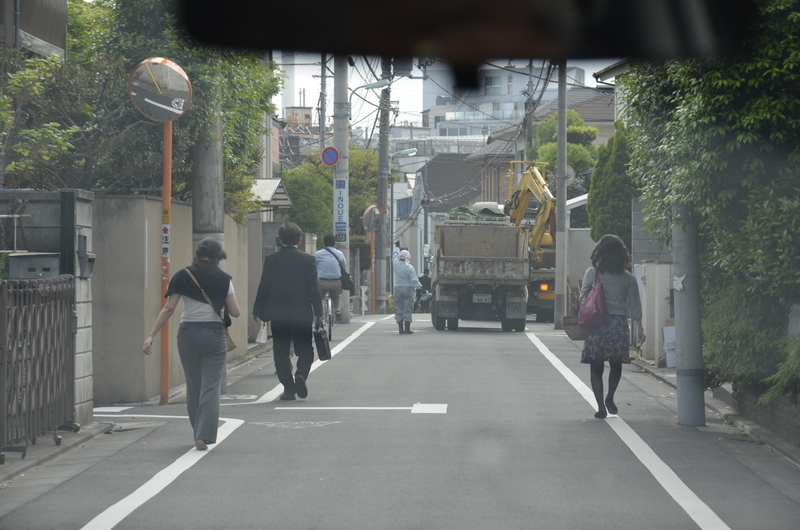 Why do I write about German recycling and cars on a blog devoted to my travels in Japan? Because the car in Japan also seems to represent a departure from otherwise universal societal norms. This particular skill or awareness, or rather the lack thereof, really struck me when I returned to the US. People in a supermarket aisle would stop to think, answer a call, or just look at products, completely unaware that they were blocking the way for others. 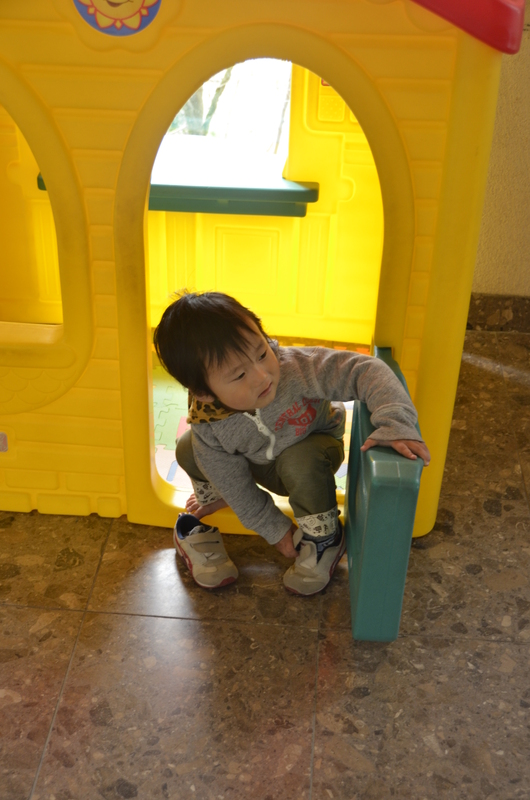 In Japan everyone removes their shoes upon entering a home. This is so engrained that I spied a child of 3 or 4 years removing his shoes when entering a little plastic playhouse next to a restaurant at an amusement park. He did this without any parent or guardian there watching or instructing him to do so. Children I saw during my month in Japan in general seemed so much more well-behaved than those I’ve seen at home and other countries. 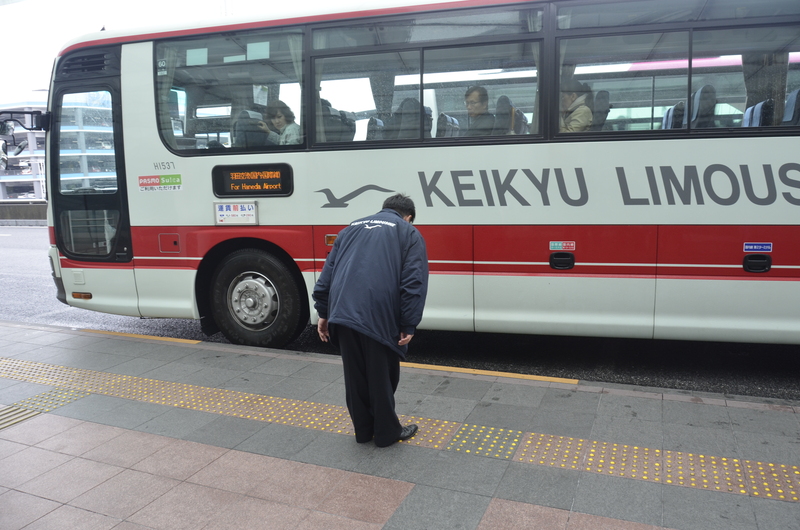 One place you do not see this consideration, this universal deference to and politeness for others, is between cars and pedestrians. 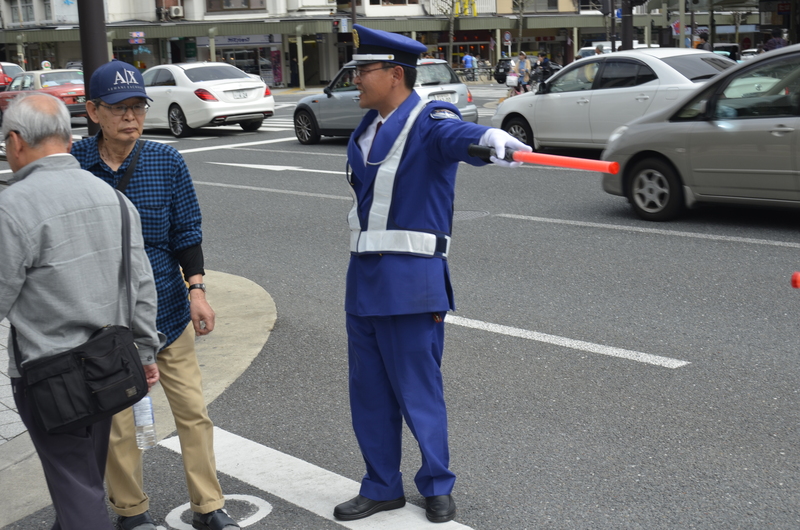 There are a high number of cyclists and pedestrians walking along the sides of the narrow streets in Japan, and certainly motorists drive around them without rudeness. But one should never try to cross a street without a crosswalk and a green signal or a human crossing guard. To do is life-threatening because cars do not seem to slow down. 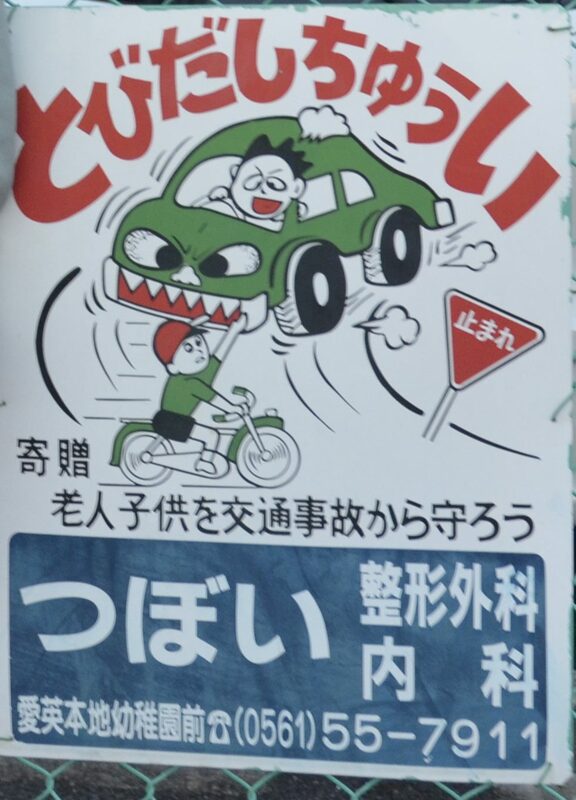 Indeed, a common sign you see is this one, which reads tobidashichui which means, “caution, don’t jump out into traffic.” Although I saw no road rage, heard no shouts or horns, and witnessed no angry or rude gestures by motorists, the depiction of the car and driver being monstrous and malicious seems consistent with the danger I believe anyone faces if he crosses a Japanese street without a crossing guard or green signal. One thing I noticed in several large cities was that the crosswalks do not turn green at the same time as the parallel traffic. Instead, all traffic lights turn red and all the crosswalk lights turn green. Not only may pedestrians cross in all four directions, but also diagonally across the intersection. How many times here at home does the crosswalk light turn green for me, and a car, whose signal has also turned green, pulls out and turns right across my path? I always have to look to see if a) the driver sees me and b) is going to let me cross, as he or she is legally obliged to do (but too often does not). 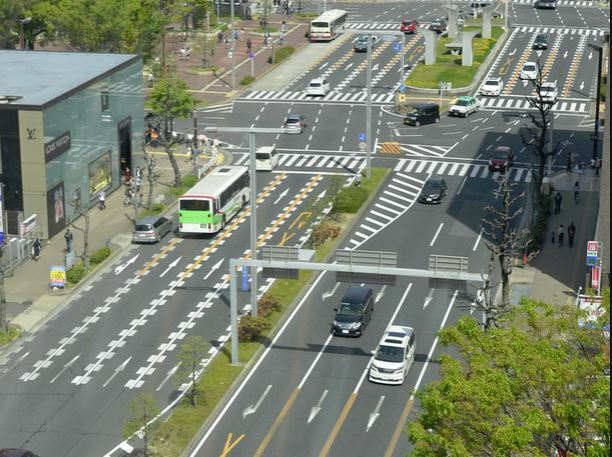 Perhaps we should try the Japanese crosswalk signal sequence here in the US.